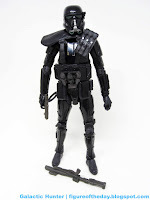 Commentary: Now this is interesting - the cheaper versions and shorter versions of the Imperial Death Trooper have paint applications that this guy lacks. 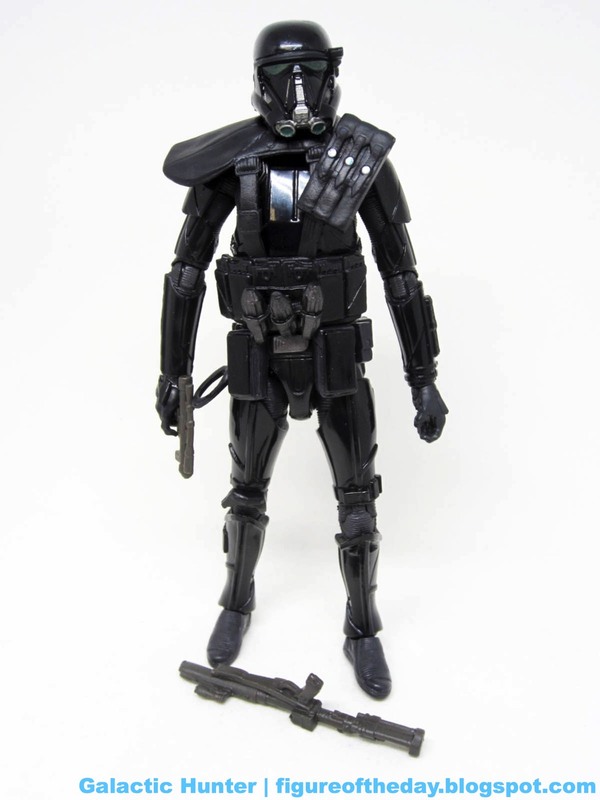 The 6-inch Target 3-pack version has the tactical gear, and you may notice that the grenade looking things over his belt are molded in black. The 3 3/4-inch figures (both 5-jointed and Walmart exclusive) are painted silver. Interesting. Other than that, the figure is basically the same as the regular Black Series 6-Inch Death Trooper with that extra pauldron and harness. Oh, and that whole get-up is one single rubbery piece, so it fits a little strangely. The black glossy plastic figure has silver buckles, and curiously matte black gloves and joints. The body glove is painted, so it's not just black plastic throughout - you will likely not notice this. 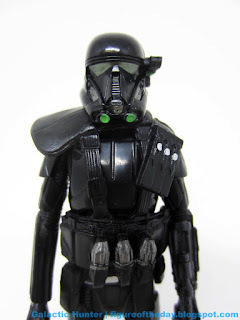 The very very dark green elements of the helmet barely register as green, which is not terrible - at least it's consistent with the other 6-inch Death Trooper - although I loves me black and bright green. I had an Apple ][+ in the 1980s, so green-and-black are the colors of technology and the future! 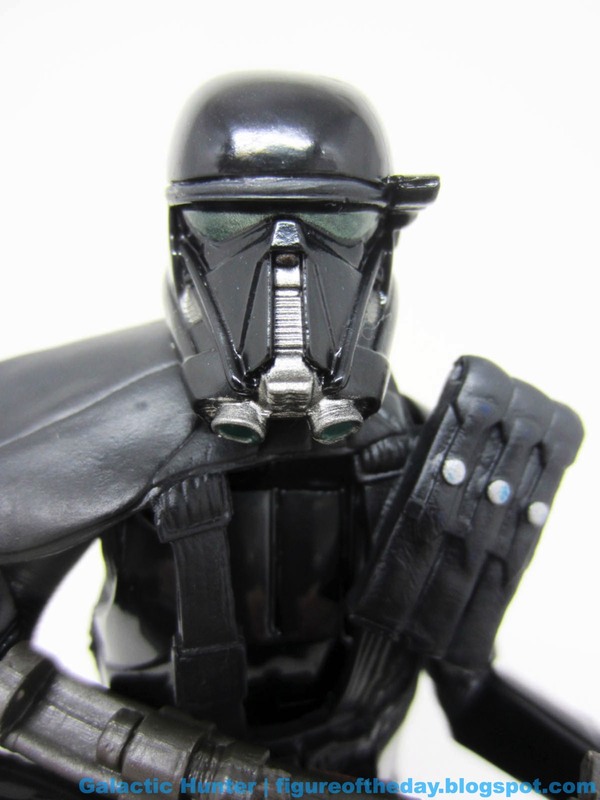 The helmet has nice silver bits and the ammo pouch on the shoulder has silver snaps. The Vader-esque belt buckle also has some silver paint. Articulation is, as the previous version, very good. Mine is sturdy with double-jointed knees, swivel hips, bend-and-swivel wrists, and everything you could want short of double-jointed elbows. 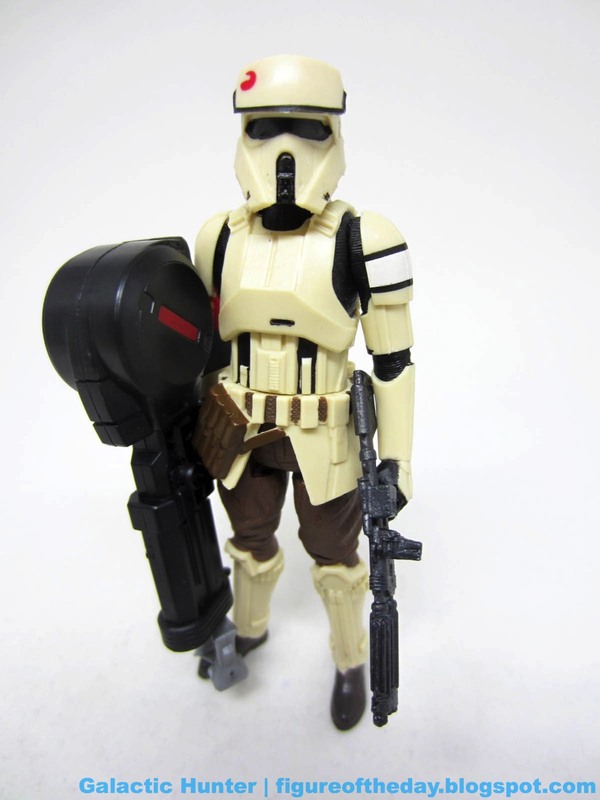 It's a great Hasbro figure, and he has no problems holding his big rifle with both hands. 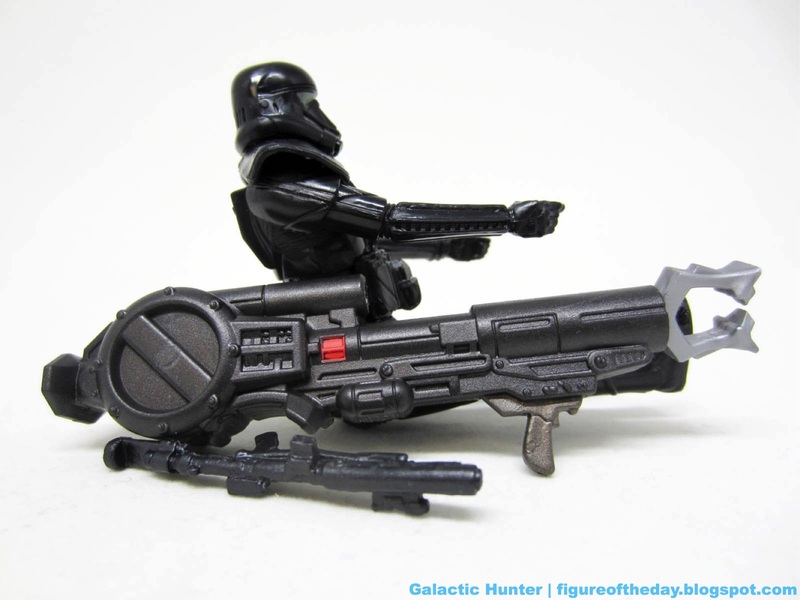 The little blaster fits nicely in the holster, so the figure seems to work exactly as designed. There's a little room in the harness area, but given the figure's articulation you'd rather have some slack than not - these things can break under stress, after all. 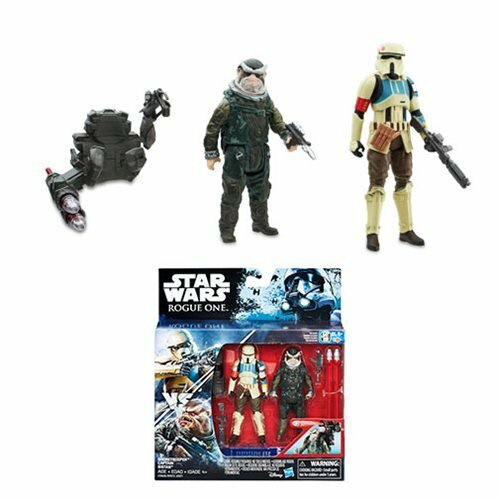 As part of a 3-pack which infuriatingly includes the same friggin' Jyn Erso, you may be waiting for a sale. I can't blame you - I got it at full price (OK I had a coupon when it hit in October) but it's getting marked down at some Targets. For $40 or less, this is a good set. If Jyn Erso is something you don't already own, even $60 is decent. 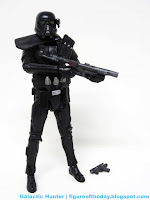 I would advise making this set your very first purchase for The Black Series if you're getting in to it late in the game, just because you can skip single Jyn and probably the regular Death Trooper too - this one's just better enough to make it the superior buy. Commentary: Oh, there are stories surrounding the mold of R5-K6 that would stun and delight you. Some are so ridiculous you wouldn't believe me if I was allowed to tell you them - but they're true. Some are very believable. But for now, all I can tell you is that it exists and it's pretty good. 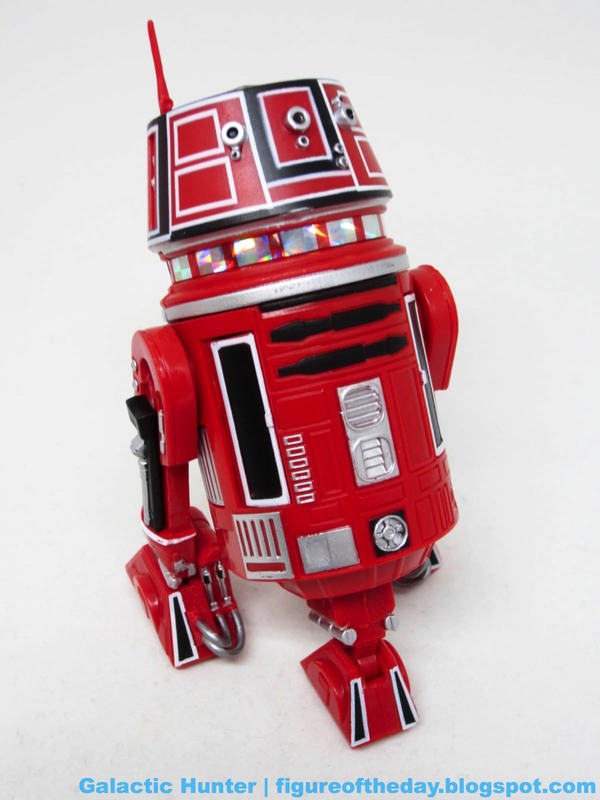 Red Leader's droid was made twice as a 3 3/4-inch scale robot - once for Disney's droid bins, and once in the scarce and popular "Scramble on Yavin" Battle Pack. Weirdly, I found a bunch while it was super duper scarce. Life's strange. So is Oxnard, CA. The droid uses the R2-D2 body from 2013 with new deco and a new dome - but you knew this. You know the score. He's not even 4-inches tall - unless you count the antenna - and has a real sharp prismatic sticker around its dome. This is a first, as far as I know. The paint applications are sharp, with black and white boxes all over the figure and one of the most ornate domes you've ever seen. 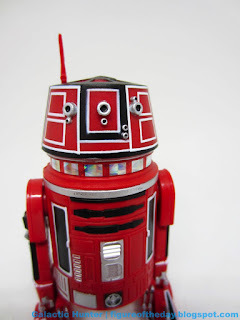 This droid's deco, as well as the Death Star control room, all look like they came from a completely different movie series - it's gorgeous and vibrant, not quite the "industrial test kitchen in space" look that seems to be very popular on most ships. If you didn't know this design was in the original movie, I'm sure it'd be derided as being from the fever dreams of some designer vinyl toy fanatic. But you know better, and so do I. 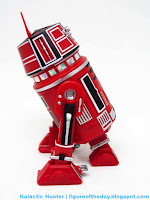 The functionality from R2-D2 is mostly maintained - the black panels on the legs come off to be swapped out with booster rockets (which are not included), and the black panels on the front open to reveal two articulated arms. You may have to fight a bit to get the claw and data port out, but they're both there. If you twist the dome, the third leg drops down. All three legs have wheels. The final design is sharp and crisp. 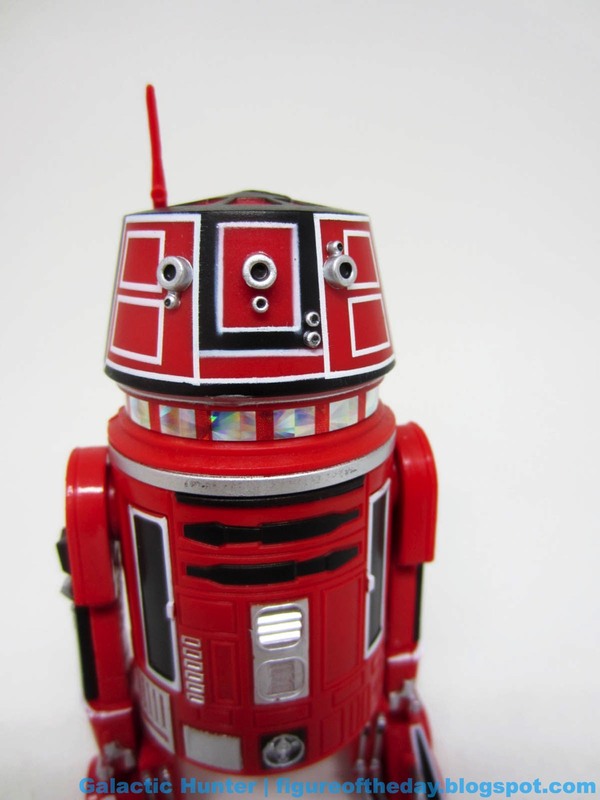 Unless you're suffering from droid overload, you probably will want to get this set. I don't see them around much anymore, but given the price of R2-D2 since he first disappeared it would seem there is indeed a market for 6-inch scale droids. I sincerely hope you got yours when the getting was good, mostly because Hasbro seems to have backed off from its proclivity to repaint everything in recent years. What a shame! I hope more repaints of this one are on the way. Commentary: Is it R2-Y9... or R7-F5? Born of comic, re-created by vehicle guide book. Which is correct? The action figure, of course! 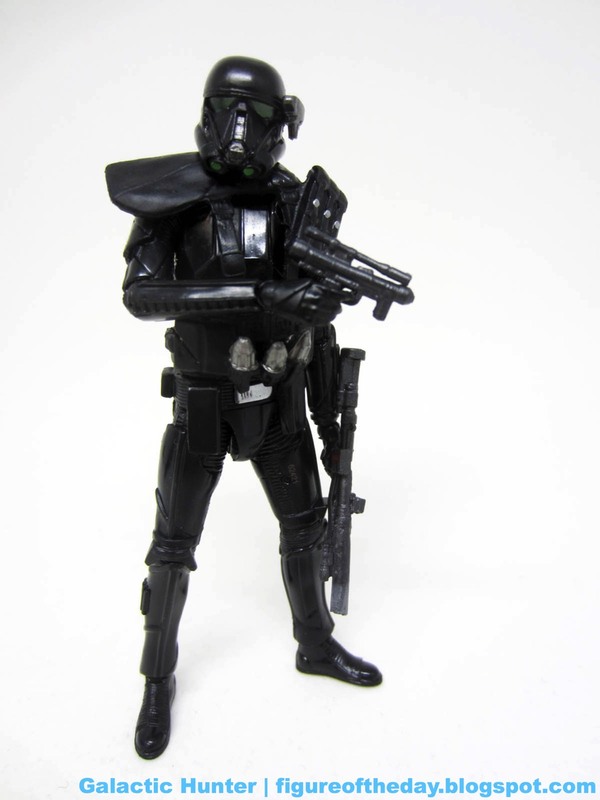 Hasbro went with the name R7-F5, so that's what it is. That's how this works. If Lucas' camp changes it again, great - but this is the name they assigned to it in the gorgeous handsome exclusive boxed set last year. Am I biased? Oh yeah. The Clone Wars has a ton of awesome droids, many of which I pitched but not all of which were taken. Some of them seem to be on the way elsewhere in the near future, but let's not dwell on that now. Agent orange here takes the same Bartoo Deetoo body and slathers it in new pigments - a grey head has orange markings, which are matched on the legs and body. White highlights bring it to life nicely, and while mine stands fine on three legs it would seem mileage may vary - from set to set and figure to figure, that third leg sometimes works like a charm and sometimes works some of the time. 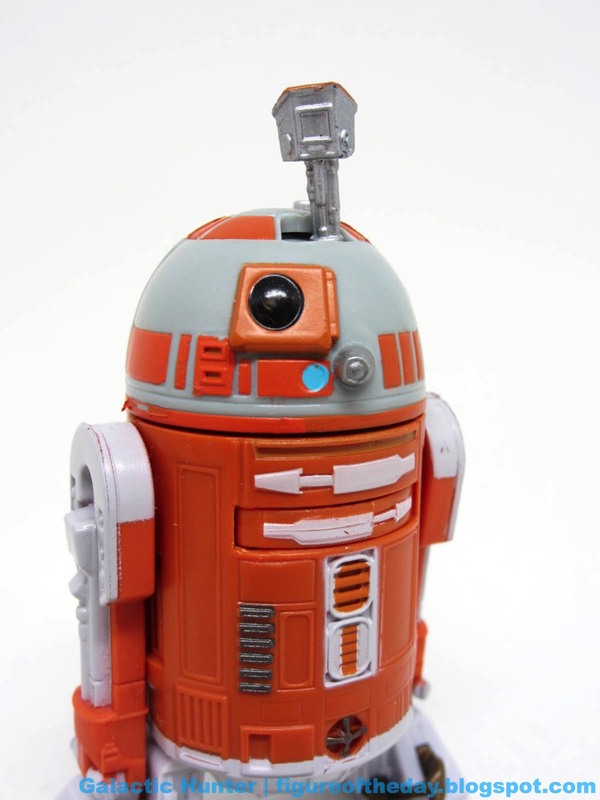 The clean droid looks sharp, giving us more of a color we don't see a ton of in this line. 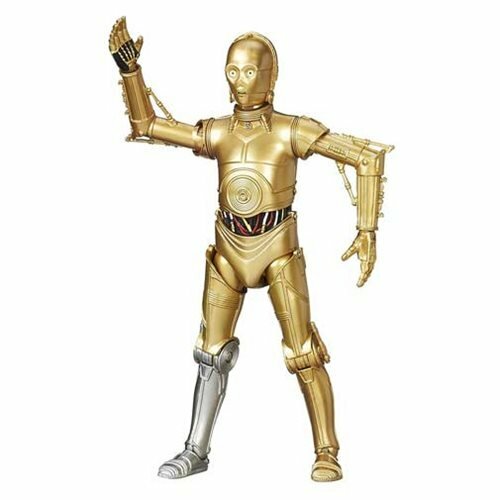 Disney had a different orange droid part suite recently, so this precise configuration as seen in "Shadow of Malevolence" is only available as a toy in this boxed set. So far. Maybe someone can make another one later. 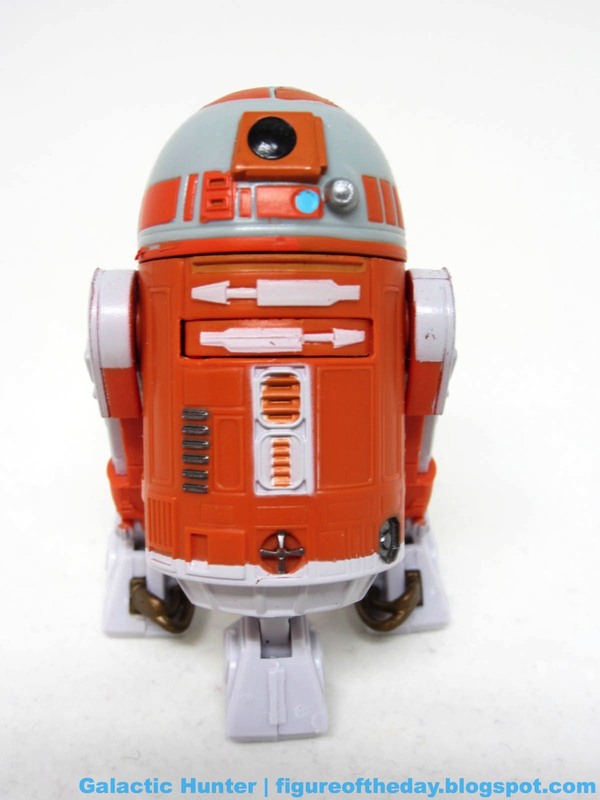 The good thing or bad thing about the astromech droid format is that there's not a lot to do with it. You can pop open a chest compartment to whip out an arm, you can raise a sensorscope by pushing up on that third leg, and there are little wheels. It's cute. If you go for this kind of thing - and I hope you do - you can order them online or at some smaller comic and collectible shops. It's not a significant character in the saga, but I can say that the people behind the set were devoted to ensuring fans had a crack at an exclusive boxed set with six new droids and nothing in it that's just different enough to make you mad. I'd say the goods were delivered, and I hope the QC on each sample is as good as the one in my basement office. Collector's Notes: I got mine from Entertainment Earth, where it is an exclusive. I work there and was heavily involved with this exclusive... so please do buy a set. Commentary: There are at least four flavors of the 3 3/4-inch Imperial Death Trooper so far - I need to review more of them. Three of them are five-jointed affairs, like this one. Hasbro did a nice job here - it's not the exact same sculpt as the 2-pack version, but it's close. It adds a new big weapon and unlike the rest of the line, Hasbro expertly tooled this one so he can stand while holding it and not fall over. It's not precariously balanced either - he's been standing on my desk for several minutes as I type and seems to have no problems as I punch the desk and otherwise act like a brat. 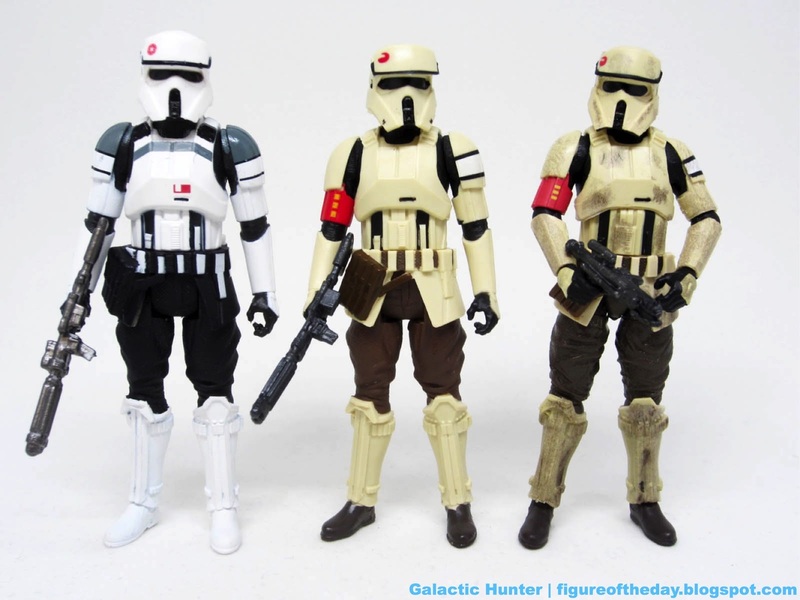 The tall trooper is built very similar to the others, with long limbs and legs that swing forward without a fight. It's great! It's shiny and black, with deco that's good - but not necessarily perfect. 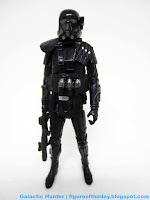 The bright green "tubes" on the helmet look great here and are brighter than The Black Series Walmart release. The lenses and silver snaps are brighter, so in many respects this is a better looking - but not posing - figure. 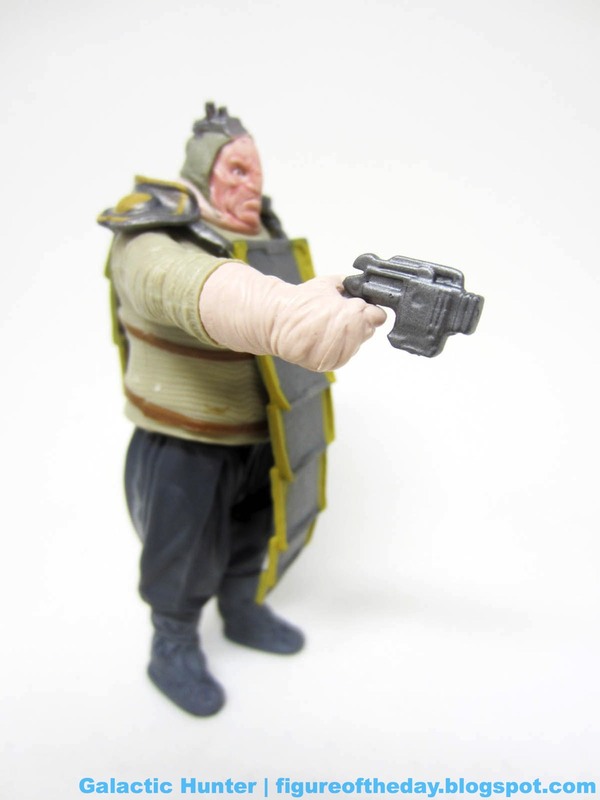 He has no problems standing, sitting, holding his guns, and getting taken down by Baze Malbus. The smaller rifle is similar to other rifles, but it lacks the paint (red dot) of its more expensive peers. It's nice, though, it looks OK but in one hand it does come off as a bit silly. 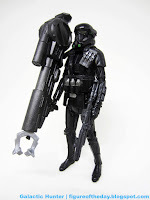 Also silly, a giant claw weapon with retractable string that is clearly inspired by the small rifle - most of the design comes from enlarging and remixing pieces of the smaller weapon, so it's very Star Warsy. Hasbro did a bang-up job making something that is a big and goofy toy, but dammit, it belongs. The mechanism doesn't lock once you pull the string out, so it's a wonky toy. Functionally it does what it's supposed to do, but as we've described here earlier the inability to "lock" it sort of negates a lot of the fun. It auto-retracts and you can't use it for a trap or set up a cool camera shot or something. At least it looks neat. 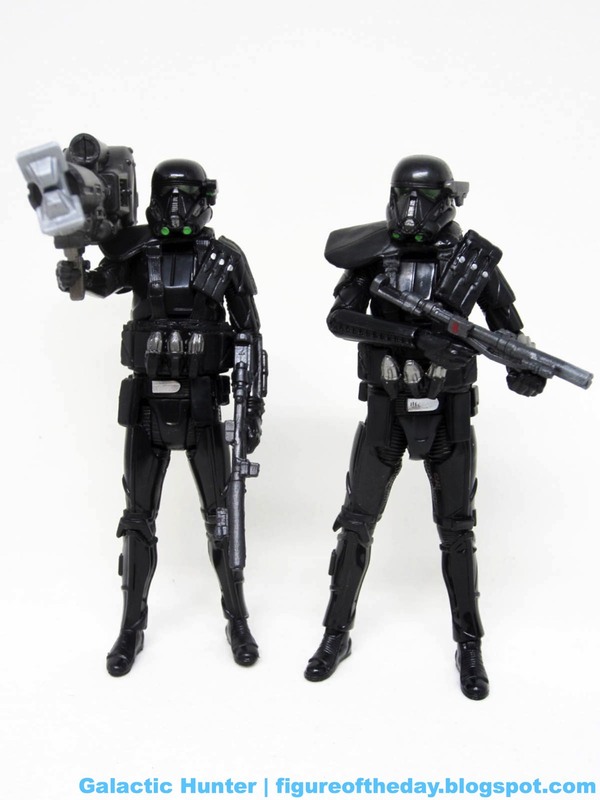 Between the 2-pack with Pao, the gift set from Kohl's, and the Walmart figure, you've probably got enough Death Troopers. Then again, there were 6 in the movie and they're all a little different, so it's like building an army without having actual duplicates. I rather like that. If the whims hit you - and opportunity is there - get this one. The only knock against it is that the buckles under his harness aren't painted - the 2-pack version has painted buckles, so they can't all be perfect. It's close though! Commentary: Often sold as Scarif Stormtroopers, this figure is interesting because the packaging says Shoretrooper on it. 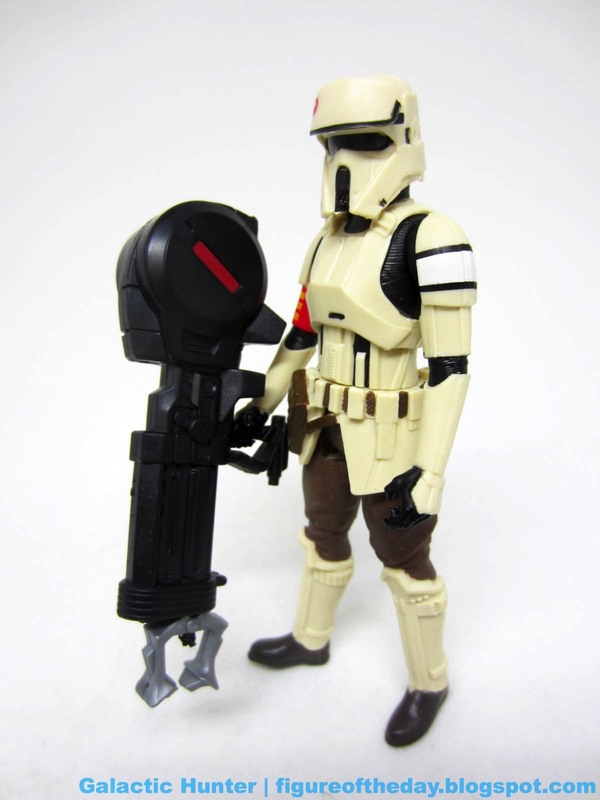 It's strikingly similar to the Imperial AT-ACT Driver [FOTD #2,330], but it's not the same mold - the Shoretrooper is actually good. It's better than the driver, which hurts given the driver was a lot more expensive. Walmart's The Black Series Scarif Stormtrooper [FOTD #2,328] is best, but if you're building an army you'll want a couple of these too. Why? For starters, a different blaster - the super-articulated version has a small blaster, while this one has a big rifle. It's different, and mixing and matching makes a display happy. The Shoretrooper is also clean - Walmart's figure has dirt and battle damage. 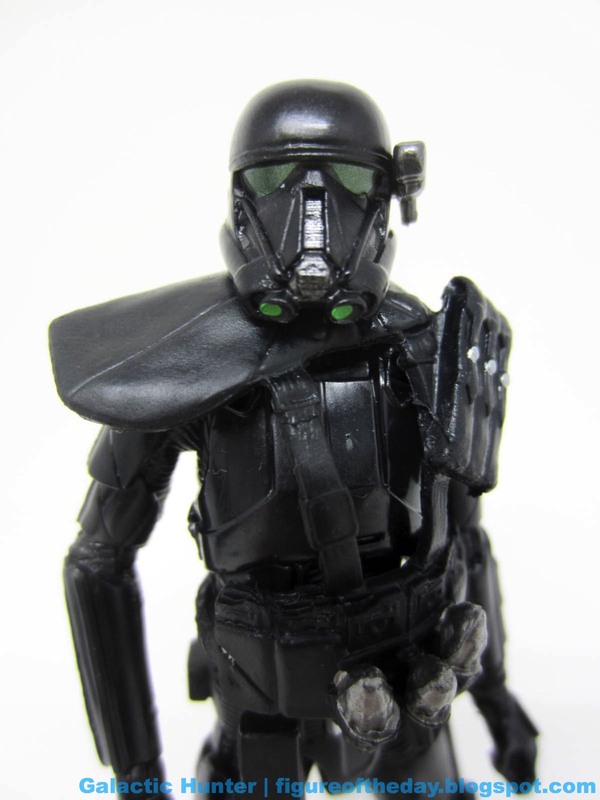 Walmart's also has the best articulation you could ask for from a trooper, while this one only has 5 joints. His arms and legs swing forward nicely, give or take the "skirt" piece providing minimal blockage to the leg movement. I love the ball-jointed neck, and the various rank markings are crisp and bright. This is a nice figure with painted ammo pouches and largely great decoration. You won't see this figure in stores, most likely because if I see it first I'll buy them all. They're nice. I haven't seen this wave anywhere other than online stores yet, so you know the drill - get it or regret it. This is probably the one you're going to want to army build if you want something clean, so... good luck with that, kiddo. I'll be happy with my one. 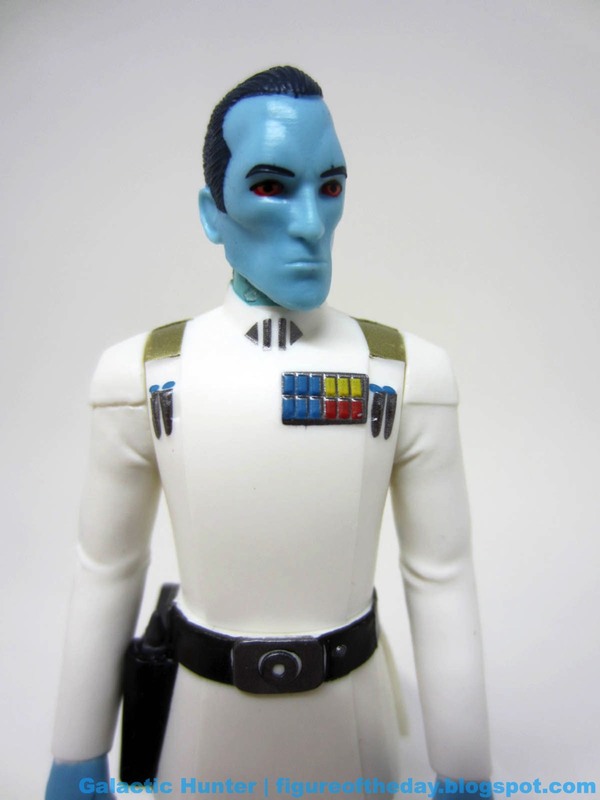 Commentary: The first new villain in the 1990s era of Star Wars, Grand Admiral Thrawn was previously thought removed from the franchise when Disney's purchase of Lucasfilm wiped the Expanded Universe slate clean so they could make movies and comics and everything else without fear of trampling over the well-trod ground. Lucasfilm did a good job keeping their stories mostly straight, so we've seen a lot of loyal fans get angry when told Jaina Solo and Mara Jade and Starkiller (the person) no longer exist. The Governor has granted a pardon to precious few familiar faces, like Quinlan Vos via The Clone Wars and now Grand Admiral Thrawn thanks to his appearances in Star Wars Rebels. The figure is acceptable. It's not bad, and it's largely consistent with others - I'm not a fan of the "skirt" piece which we saw go away briefly in the Saga Legends/Mission Series figures of 2013 and 2014. Here, it imposes a restriction on the figure's hips so they can't swing forward. His shoulders and neck have no problems moving, and his blaster fits nicely in either his hand or his holster. His costume sculpt is immaculate, a perfectly sharp white costume that gives you what Ralph McQuarrie's take on Thrawn might have looked like. The gold epaulets were replaced by a couple of gold bars, but he still has the command badge and code cylinders you've come to love. The face is nice and clean, blue and nicely decorated. 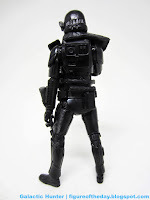 The Chiss hair is very dark blue, with shiny black boots and a nice silver belt buckle. My sample was a smidgen back heavy, but he seems to be standing unassisted without too much trouble. He won't be doing any sitting in ships, though. The gun is nice, but the spring-loaded gun is sort of ridiculous. 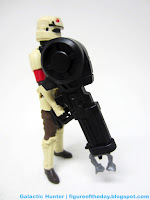 He can't stand and aim it well, and the gun does look pretty swell. I got a case, and the one I opened - unbeknownst to me - was missing the top of the blaster. It's just not there. So keep an eye out for that. The thing shoots just fine, but it's a terrible hand-mounted weapon. Thrawn is a pretty good figure and I assume if it gets good distribution, he'll be a slow seller. 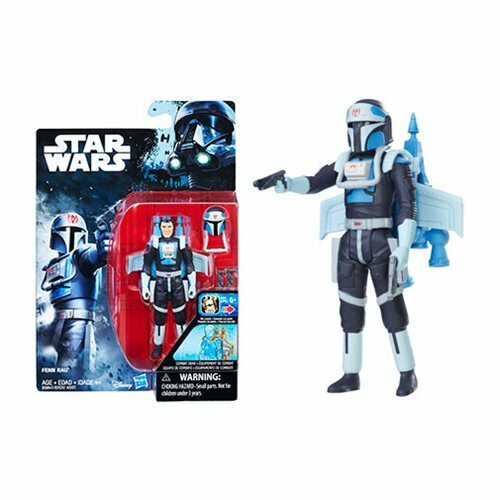 He's not bad, but the other figures in the wave are probably a bit more exciting given the love of the movies and the relative slow growth for Rebels thanks to limited TV distribution and even more limited toy distribution. (Seriously, how can Chopper not be on the market right now?) 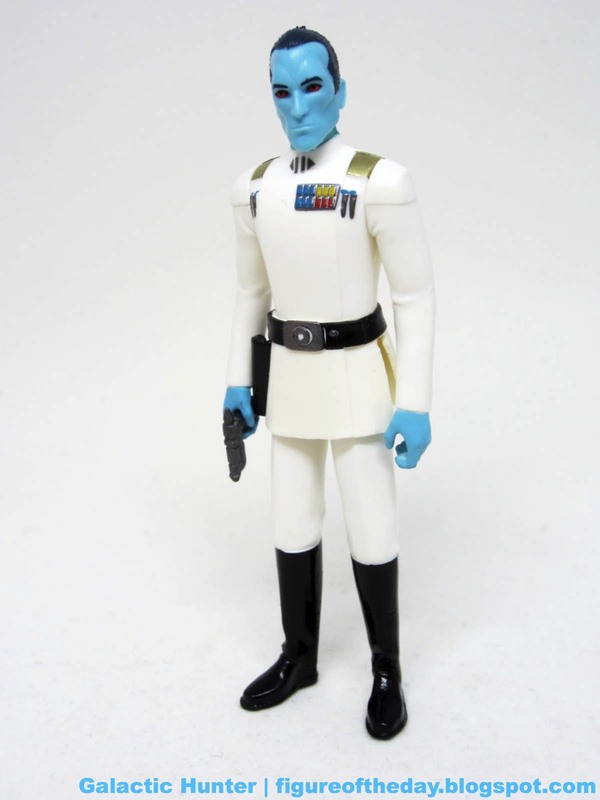 Anyway, get Thrawn if you can. You'll probably be very glad when the Rebels figures suddenly dry up and it turns out a complete collection is actually quite small. Collector's Notes: I got mine from Entertainment Earth. Two rank badge decos exist - this is the "corrected" one which matches the packaging. 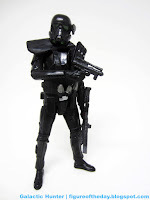 Commentary: Yes, another Death Trooper! If you're collecting all of the unique versions, I believe this is one of four 3 3/4-inch expressions of the armored trooper with the scrambled secret twin language. 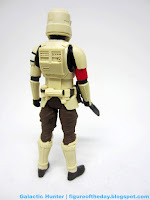 Kohl's has a sandy redeco, Pao is packaged with one, there's this one, and a basic one appears in the third wave of basic figures. Are there more coming? I sure hope so - it'd be neat to build out an entire squad of six without resorting to buying duplicates. This is, in theory, the best Hasbro has to offer. You get two blasters and no holster - the bigger one has a loop for the small pistol. My opinion of this figure improved significantly when I popped off the head and removed the pauldron and various straps - it's pretty easy to do, and it opens up the figure's considerable range of articulation. There are no rocker ankles, but it's pretty much everything else you could want. Bend-and-swivel wrists are just some of the 28 joints. I love how easy it is to pose him with both hands on the rifle, and the sculpting is on par with or better than the other, stiffer versions. Having thigh swivel joints and enhanced deco - somewhat - help. 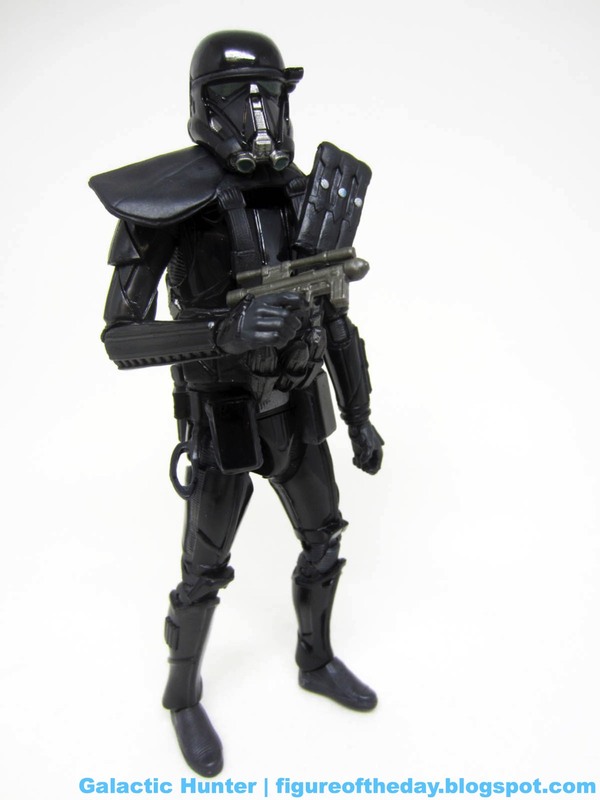 The rifle has a painted red mark on it, the removable bandolier pieces have some silver, and the bits on the helmet are a tad more reflective and shiny. I can safely say it is quantifiably better than its peers, and you're charged accordingly. 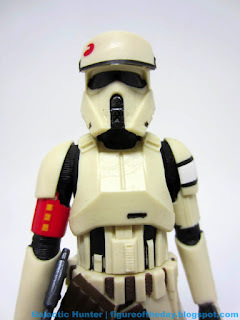 This is the trooper articulation you want, with the only real hinderance being the belt - and you can remove the belt to fit him in a ship or something. After futzing with it more, I'm kind of surprised it wasn't scooped up even faster as it's better than others would have me think. Get this one and futz with it, you're in for a small treat even if the entire squad didn't get to be particularly cool in the movie. ...I better buy a couple more of these. 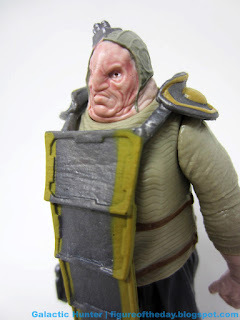 Commentary: I sat on Unkar Plutt for a while - he's been on my desk for months, and I want to move him to his new home. This is a really neat figure, mostly because it incorporates some fun features. For starters, you can rip his arm out of his socket - this is most likely due to a scene that was actually shot where Chewbacca, uh, disarms him in a fight. You can replace the arm with the "Cobmine" weapon - a larger claw that just happens to exactly fit the missing limb's footprint. 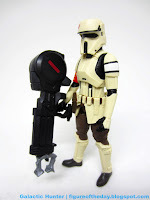 It's the kind of classic Kenner thinking that's brilliant and wonderful, and I hope we see a lot more of it. There's a problem, and a solution - and you can also use the claw to put together some dumb tripod rocket launcher thing that looks like a bad high school art class "found object" sculpture. 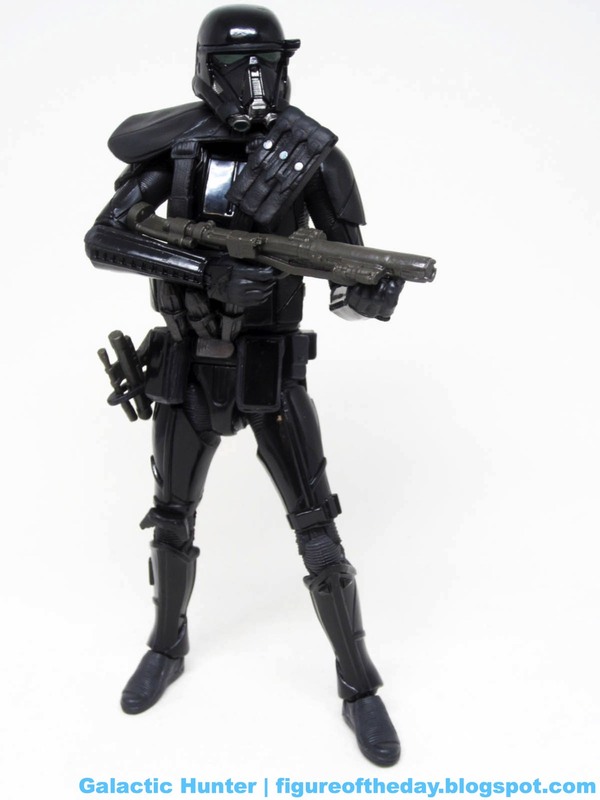 The figure itself is pretty good, it looks a bit like the movie. The blobfish who surfaced too quickly is big and pink, but not hugely tall - in the movie he's not exactly huge either. 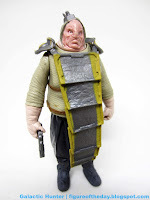 Much like Jabba the Hutt, he stands higher than others behind a desk so size comparisons are tough to suss out unless you see the aforementioned deleted scene where he's basically the same size as Rey. The texture on the skin and shirt are great, the bizarre armor plate is good, and the colors are basically as good as you can expect from Hasbro's encheapened figure line. Thanks to the removable arm, he has six points of articulation. 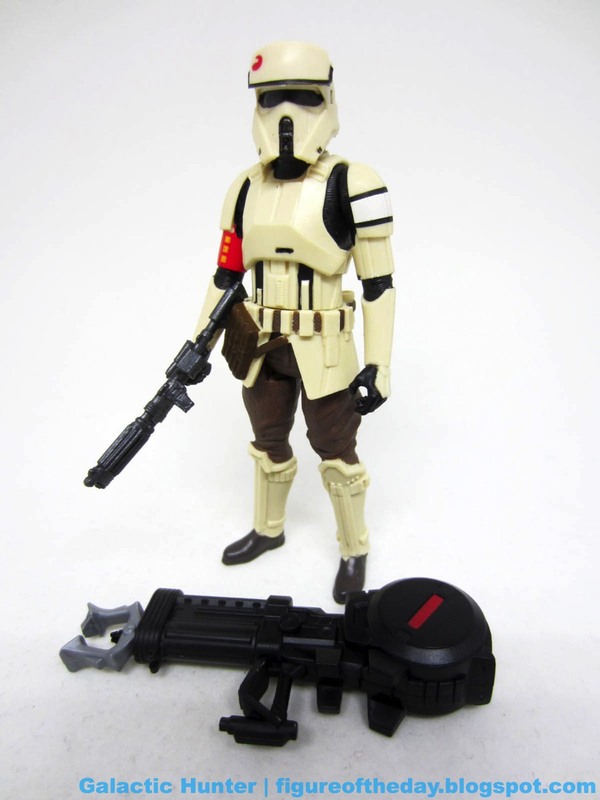 You may disagree, but I think this is one of Hasbro's better executed figures. The armor that rolls down the front of his body is nice and flexible so he can sit with it. The legs swing forward and unlike many corpulent plastic gentlemen his legs don't have a v-crotch. 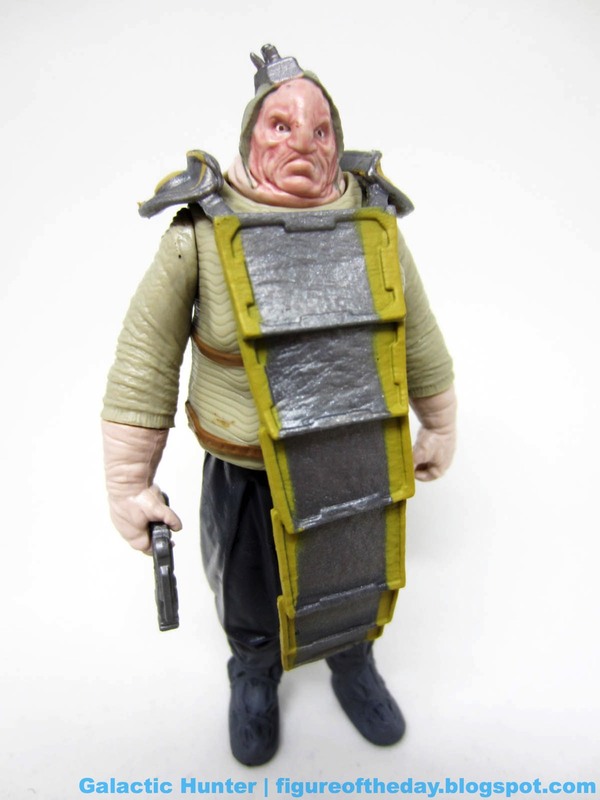 The armos swing forward nicely, and it gives us something Simon Pegg probably always wanted - a Star Wars figure of himself. And residuals. Presumably. 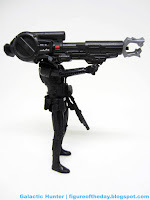 The plug-in arm is cool, and has three jointed claws. 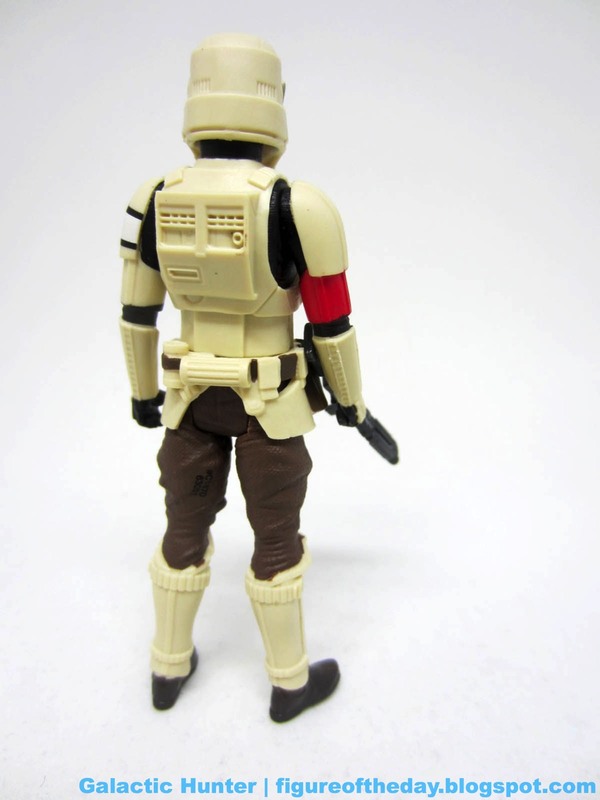 You wouldn't miss it if Hasbro left it out, but it's a far more interesting accessory than most of what we got for The Force Awakens. 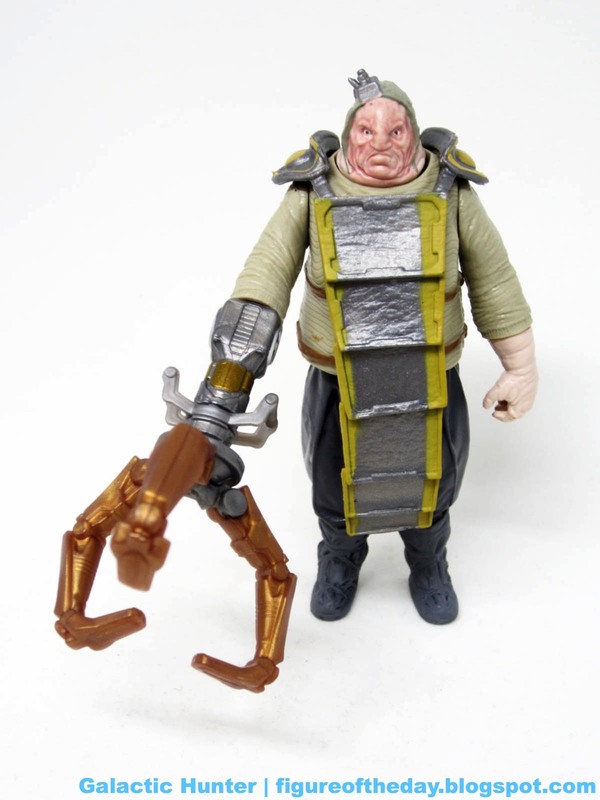 It's not the most Star Wars-y thing ever, but it serves a function to this figure specifically, building on a (deleted) story idea. Unkar Plutt will probably have both arms when he appears next time, but I have to say I appreciate Hasbro giving kids a way to play out the (again, deleted) scene and also put him back together again so he can still play. The figure was designed prior to the film's release, so it's sort of a deleted scene figure - just not intentionally. He was a slow seller in 2016 and he's starting to vanish - get him if you still can, he's swell.